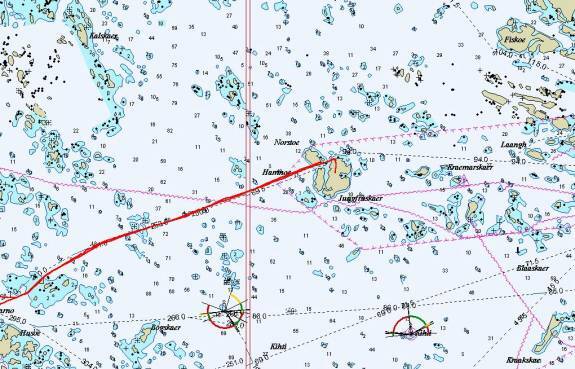 The southwest coast of Finland is a series of archipelagos and the charts of the area are daunting. At first glance the water looks more solid with rocks and small islets than navigable water, but there are numerous well-buoyed channels and many cottages. 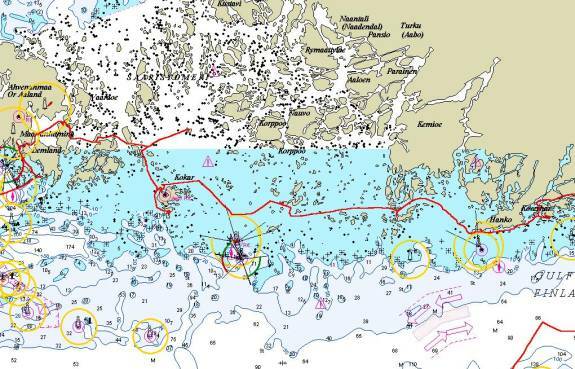 Although the channels are well buoyed, the Finns manly use cardinal buoys (black & yellow) even for fairway channels rather than lateral buoys (red and green). 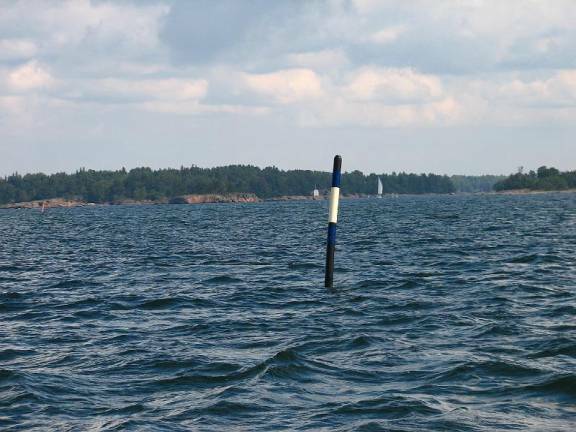 In North America, the cardinal buoys have double triangles help identify the direction of safe water. 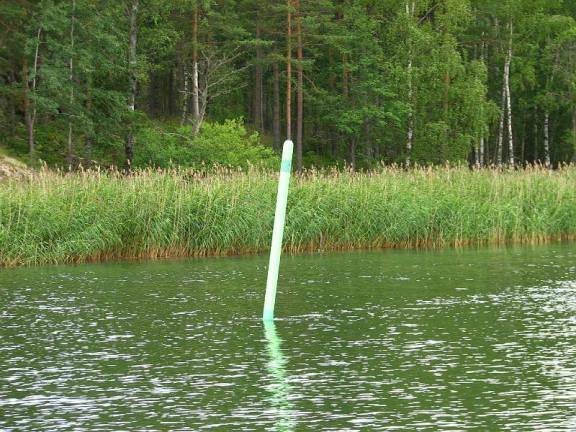 In Finland the cardinal buoys only have black and yellow or white colour, and often it is very hard to determine if a buoy is and east (black-yellow-black) or a north (black-yellow) because the black bottom of the east blends in with the water colour. The boat traffic is heavy in July when Finland is on vacation. The narrow, twisting channels mean it is difficult to sail unless the wind direction is favourable or you know the waters well. It is very much like Georgian Bay on Lake Huron in Canada. 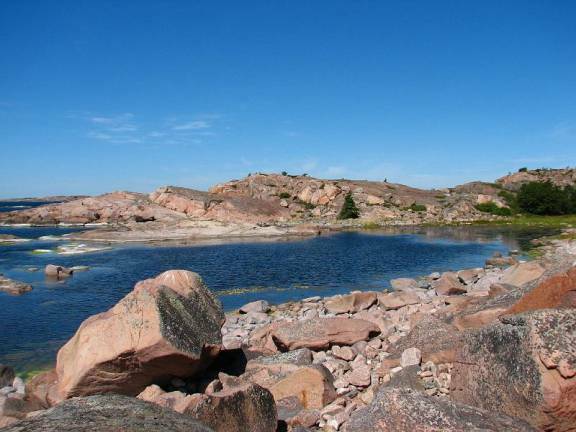 The various shades of red/ pink / orange granite was reminiscent of Georgian Bay and the North Channel back in Canada. 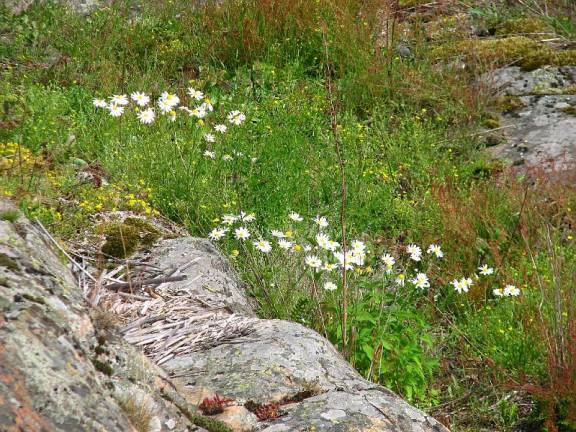 The vegetation was also familiar: birch trees, blueberry bushes, raspberries, lichen on the rocks and trees and summer wildflowers. Because of the cold dry spring the crop of blueberries was too tart to enjoy. 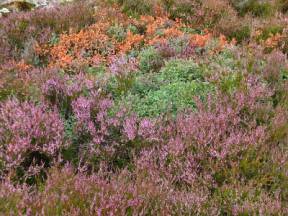 The grasses were dried up and the birch trees had yellow leaves by the end of July. 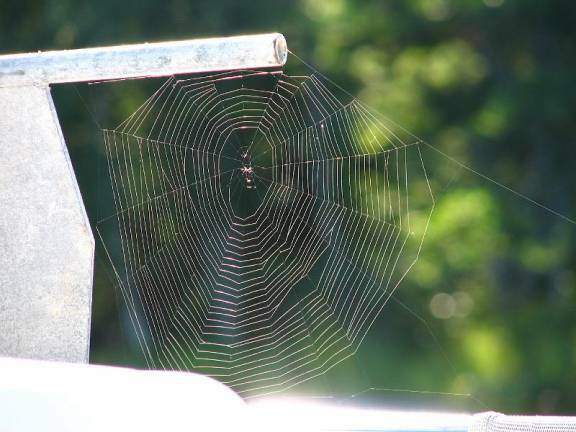 We finally began to see spiders again; we had not seen many of them since our Great Lakes sailing days. 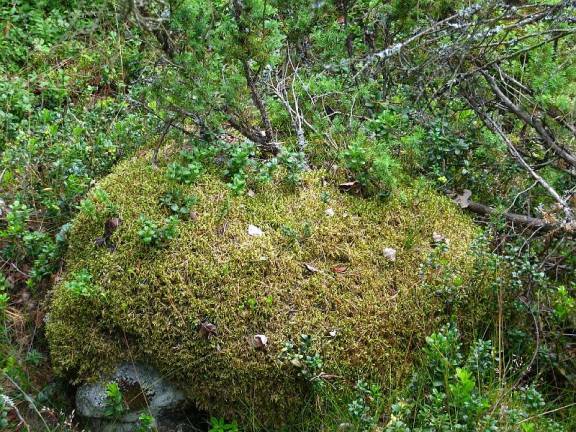 The landscape had differences as well: alder, poplar and sumac trees, and very few conifers and plenty of moss. Birch roots extend out over granite looking for a foothold and water. 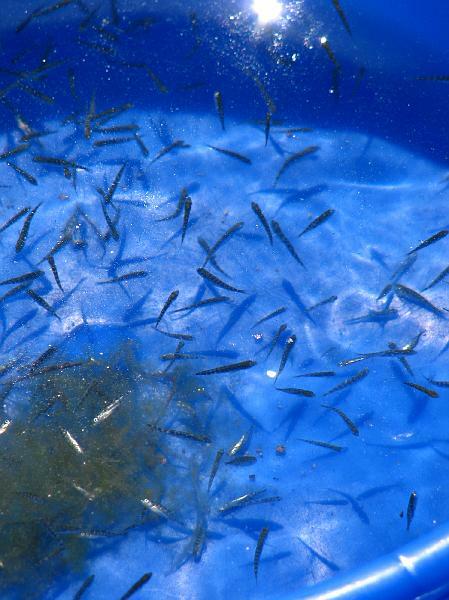 Little wildlife: no squirrels, no fish (other than hatchlings that the kids scoop up into a plastic bowl and release at the end of the day, half-dead), and no birds of prey other than a few hooded crows. 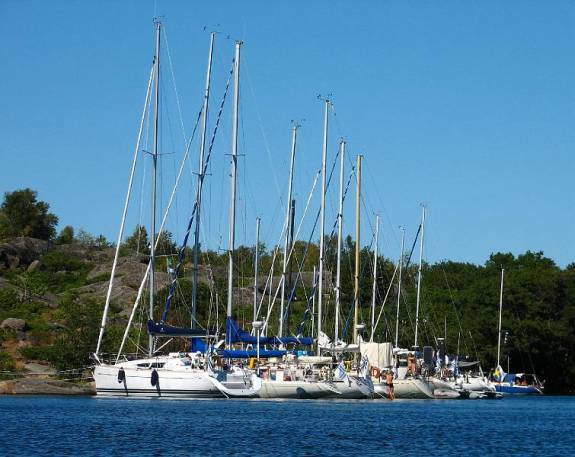 Bjorkő in the Turku Archipelago is one of the most popular anchorages. 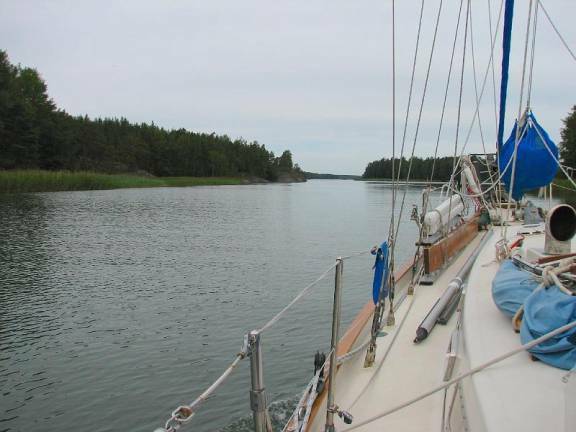 Unlike in North America, the Finns do not like to anchor off the bow and free-wheel. 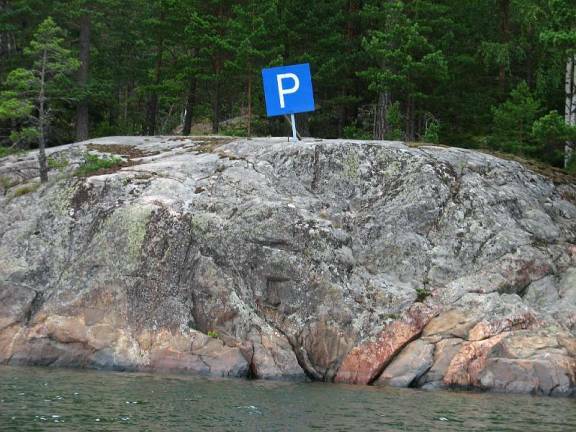 The Finns like to drop a stern anchor 4-5 boat-lengths from shore, and then tie the bow to a ring in the rock or around a rock or sturdy tree. In fact they like to do this so much, they deploy their fenders when they anchor this way because the likelihood of being cheek to jowl with other boats is very high. The boats in Bjorkő are as close together as if they were on stern buoys with bows to a dock; and believe us, if there is an inch to spare, boats muscle their way into a very narrow berth, with fenders of the other boat touching your boat. We have watched the scenarios unfold with amazement and astonished amusement. No matter how good and detailed your charts are, when you go headlong into a rocky shore, you never know what lurks under the green slime. Sometimes your bow floats all the way to shore and the crew can step/jump off the boat and secure the bowlines. Just as often, a rock impedes the progress of the boat, and damage is done. 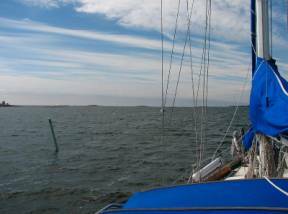 We anchored in a bay on north side of Kőkar Island (Åland Archipelago) and went ashore. The “store” had canned goods, and a cooler of drinks. A sign indicated they had Internet, but they said it was not working. We hiked a couple of miles to the local church and the ruins of a Franciscan Monastery. There was virtually nothing else to do / explore on the island. 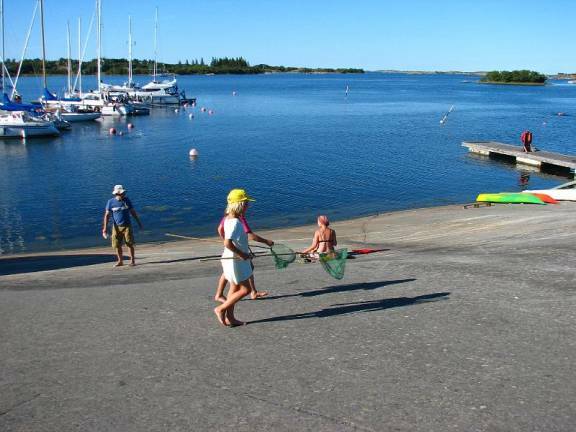 The marina doubled as a camp ground for RV’s and had a “beach” that was slick granite stone … no sand. We anchored off the south shore of Idő Island near a nature reserve. 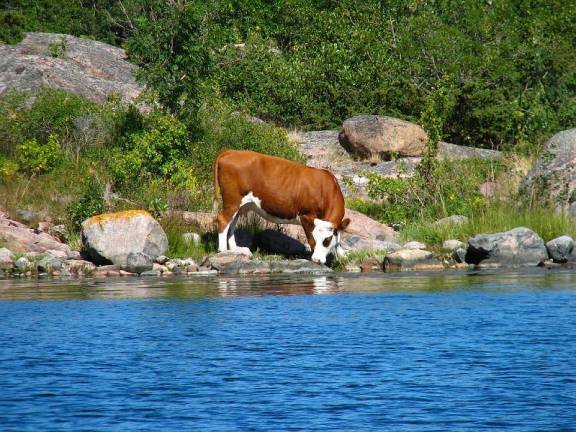 We were amazed to see a cow drinking at the water’s edge as we dropped anchor. 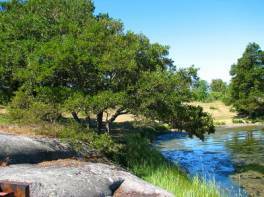 This island is uninhabited and has very little “pasture” for livestock. We later discovered there are 4 cows here and a family comes in their boat to feed / tend to the animals. The animals were awaiting their arrival. We spent an entire day exploring the water in dinghy and kayak, and hike in the nature reserve. 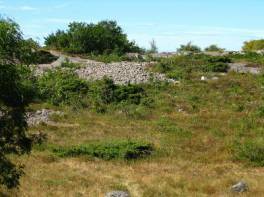 We were surprised to find mowed pastures (courtesy of the full employment policy of the Åland government) a BBQ pit and a garbage container. The gravel pathways and well-scrubbed rocks (courtesy of the ice age glaciers) reminded us of the boulder beaches in the NE part of Lake Superior. 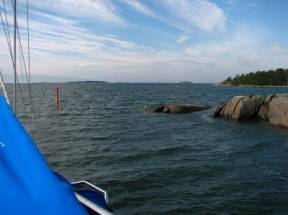 We took the dinghy to a nearby island, Källskär that has interesting granite rock formations. 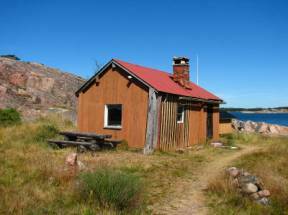 A Swedish businessman who loved spending his summers on the island bought part of the island in the 1960’s. 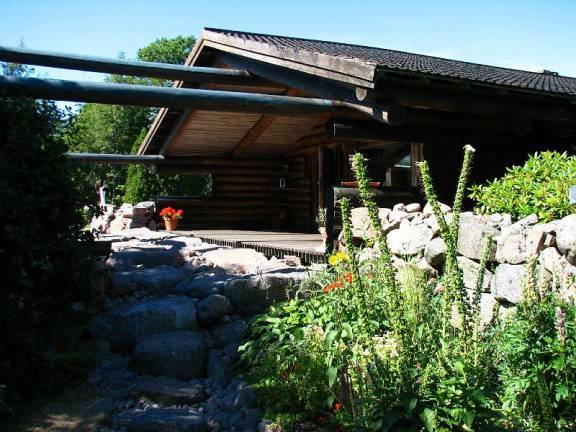 He built a large log cabin and designed a “Mediterranean” style garden around the cabin. 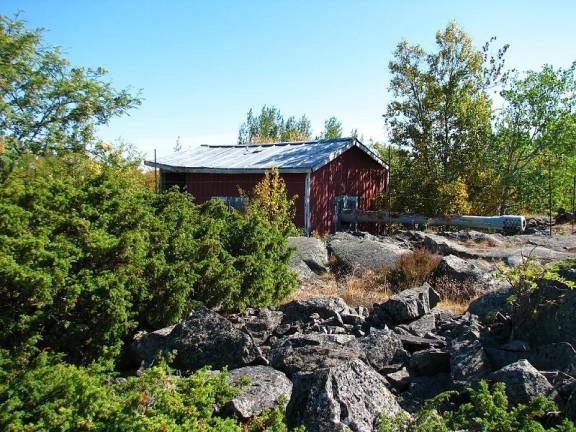 The land has been donated to an arts foundation that now maintains the property and houses artists during the summer. 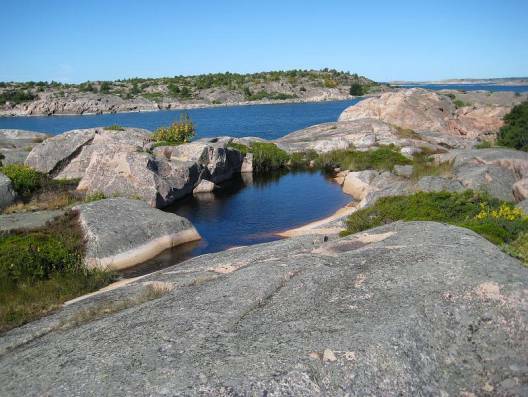 The island is at the southern end of the archipelago, so is swept by fall and winter storms; vegetation does not grow very large, and crevices in the rocks form stagnant pools teaming with life. It was an interesting hike. 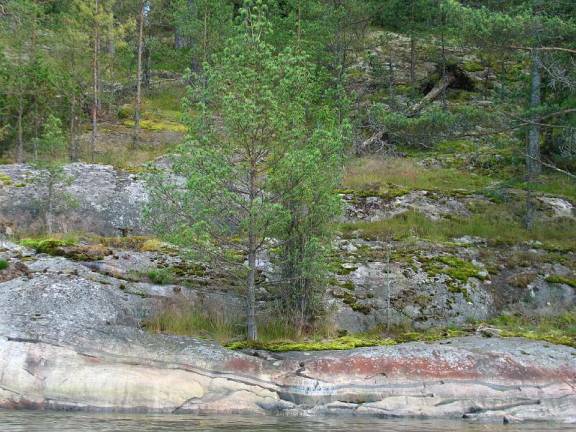 Jungfruskär is another nature reserve where we anchored. 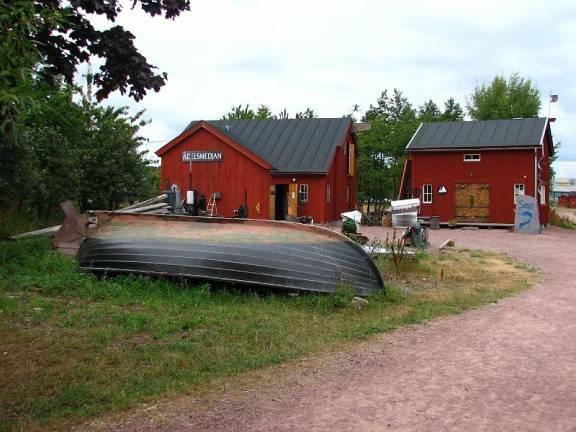 Jungfruskär is interesting because it has been farmed and also had a strategic military presence. The island is a nature reserve today, but the farmland is being preserved; there are cows on the island and the fields are tended in the summer. Cutting birch trees off about 6 feet above the ground had created some of the meadows. 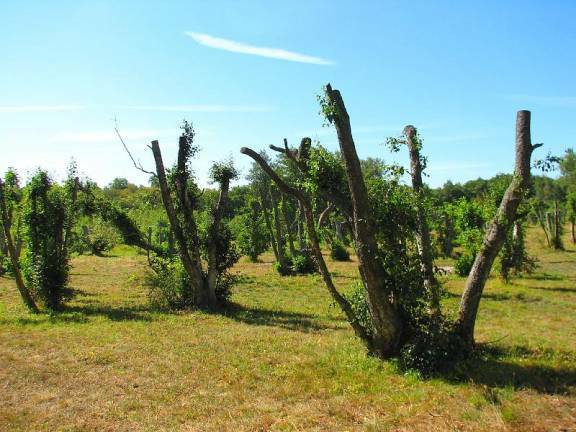 This allowed the grass to grow under the now branch-less and leaf-less trees, and was quite satisfactory as grazing land. The military presence was during the Second World War. 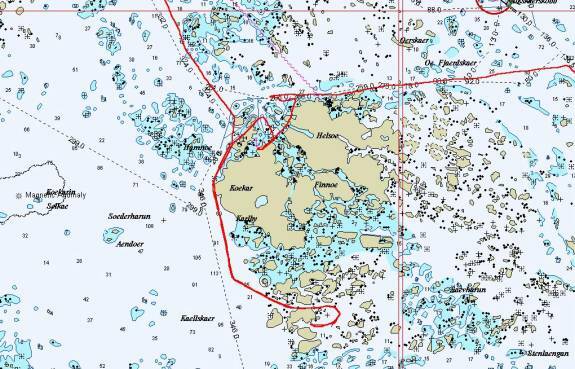 After the First World War the Åland Archipelago became Finnish territory rather than Swedish, even though a majority of the people were Swedish. The Swedes were concerned that they could be attacked either by Finland or by other countries via Finland. 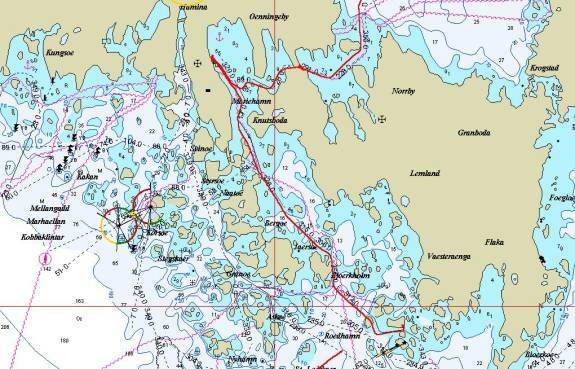 They ensured their security by making the Åland Archipelago a military-free zone. 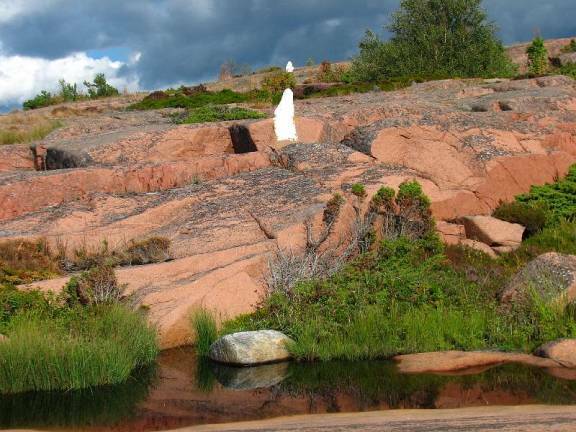 Jungfrauskär was the westernmost part of Finland, in the Turku Archipelago and therefore was fortified with several cannons aimed at the wide channel between the Turku and Åland Archipelagos. 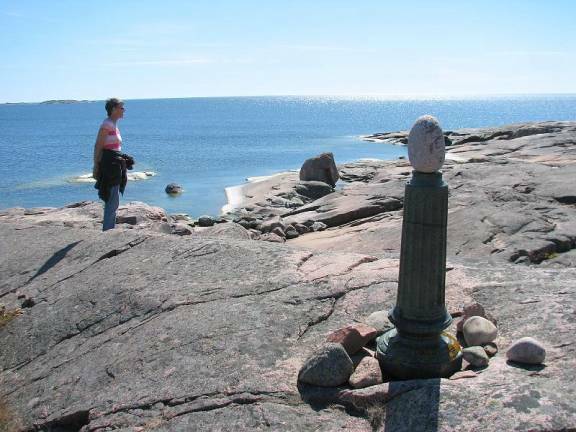 During the Second World War a Russian plane crashed on the island, the grave of the pilot and crew is marked. 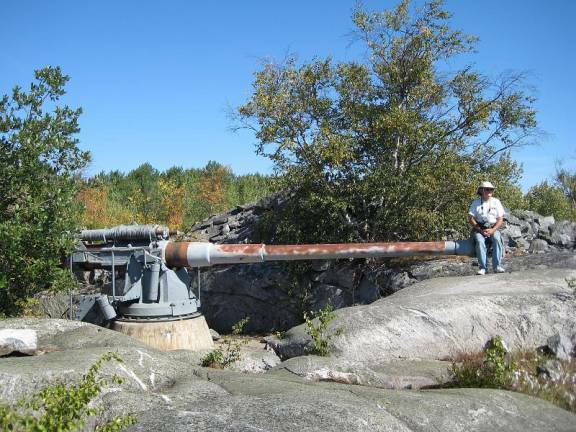 It was not until 1999 that the military presence was removed from Jungfruskär, and the existing two cannon sites became rusting relics of bygone conflicts. As we traveled west from Turku to the Ålands, Swedish became more commonly spoken and the Swedish influence was more apparent. In 1808-09 Sweden was forced to relinquish control over the Ålands and Finland by Russia. 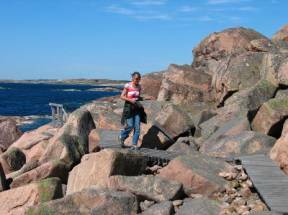 After the Crimean War in 1856 when French and British troops seized fortifications in Åland, the archipelago was demilitarized. In 1921 the League of Nations resolved the issue of Åland’s constitutional affiliation with Finland, confirmed the demilitarization of 1856 and also neutralised Åland. It has its own postage stamps and parliament, even though it is part of Finland. 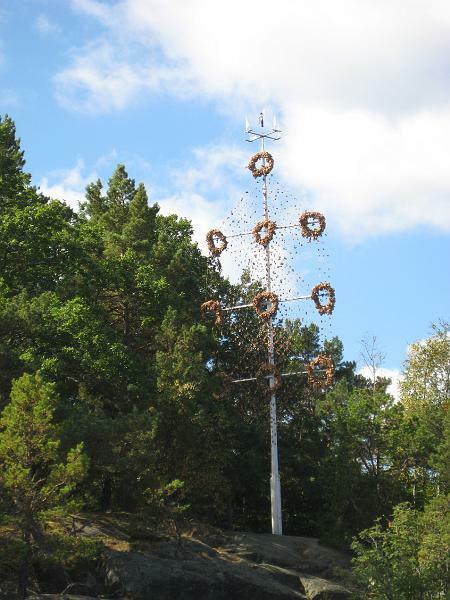 The Swedish influence was seen in more prominent and elaborate mid-summer poles at cottages. 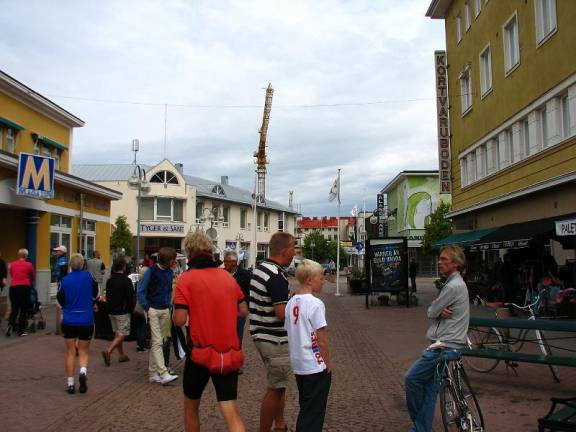 Mariehamn is the capital of the Ålands and the largest city. 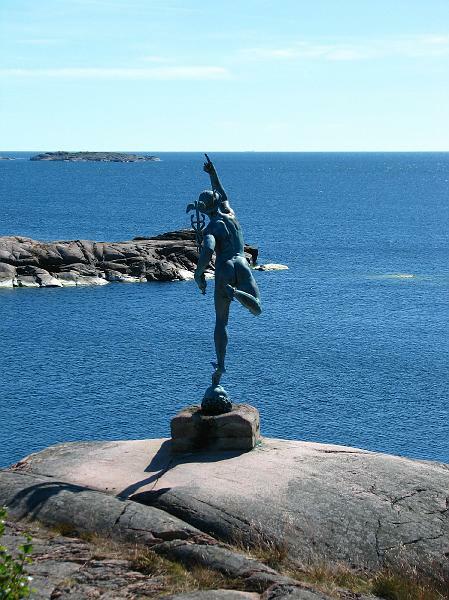 Mariehamn is a tourist city, with many ferries stopping over long enough to entitle them to offer duty-free goods to travelers. The Maritime Quarter in the Eastern Harbour houses a museum, demonstrations of wooden shipbuilding crafts, and a marina for wooden boats. 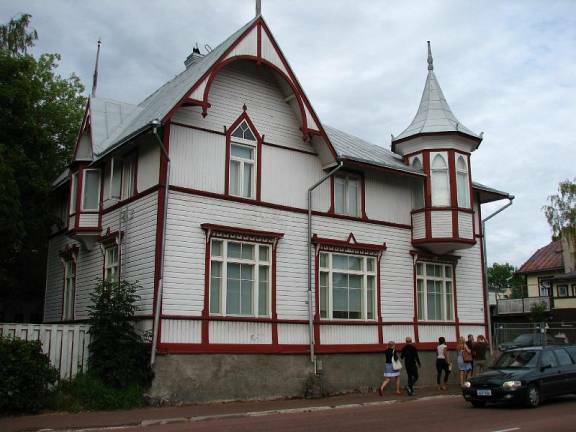 Mariehamn has promoted restoration of old wooden homes. 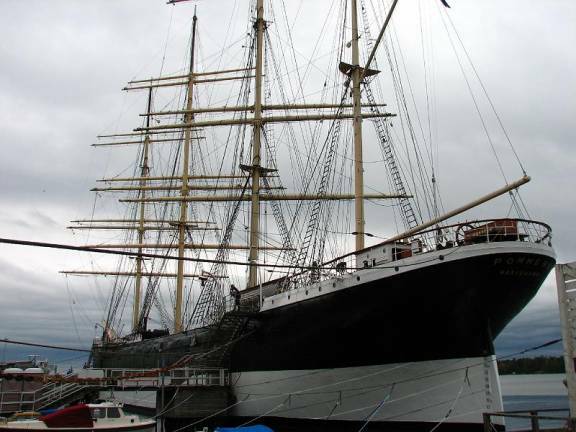 The city acquired the Pommern, a sailing ship that traveled the wheat route from Australia to Europe and set several speed records. 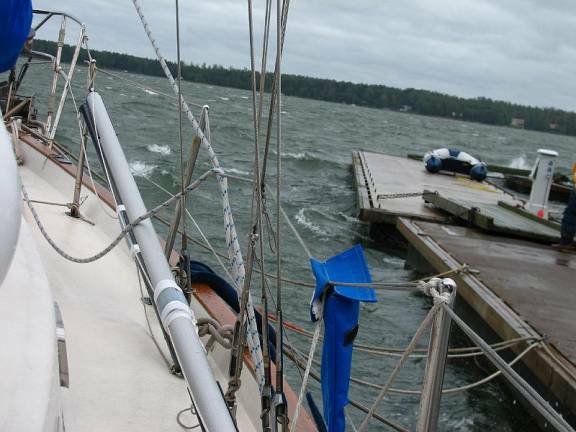 We extended our stay in Mariehamn by two days so that we could wait out a gale from the east at a marina. Even though the wind did not exceed 30 knots, it packed a punch that chafed through a couple of our docklines. 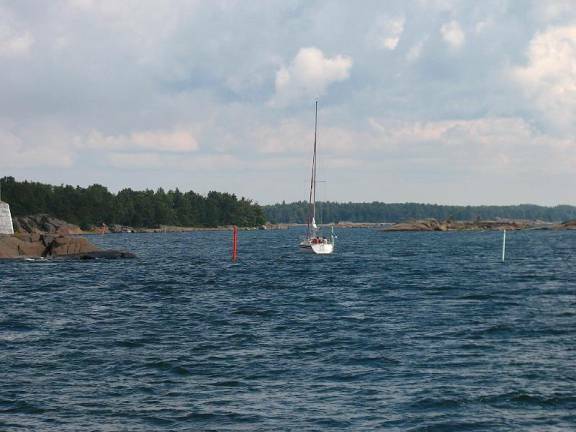 Our last port in Finland was Rodhamn, just south of Mariehamn. 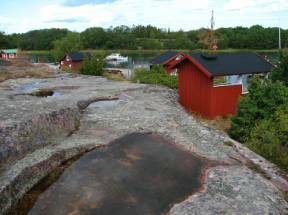 We bid farewell to the red / pink / orange granite rocks with fringes of green and headed for the Stockholm Archipelago and our 8th country in 2008.